Sen. Pete Domenici of New Mexico, an influential Republican voice on budget issues for a generation, intends to retire at the end of his term next year, party officials said Wednesday. These officials said the 75-year-old, six-term lawmaker intends to make a formal announcement on Thursday in his home state. They spoke on condition of anonymity because they were not authorized to disclose the decision. Domenici would be the fifth Republican senator to decline to seek a new term, giving Democrats an opportunity to expand their majority in the 2008 elections. GOP Sens. John Warner of Virginia, Chuck Hagel of Nebraska, Larry Craig of Idaho and Wayne Allard of Colorado have previously announced plans not to run again. A spokesman for the National Republican Senatorial Committee did not immediately return a request for comment. The New Mexico Republican had earlier signaled a desire to run for re-election, despite coming under criticism this year over possible role in the firing U.S. Attorney David Iglesias. A Domenici adviser said the prospect of a potentially tough race in what is expected to be a difficult year for Republicans was not why Domenici decided to retire. Instead, lingering concerns about his health are the main reason for his decision. Domenici's long Senate career has been highlighted by involvement in budget issues. He was the longtime chairman of the Budget Committee dating to President Reagan's first term. He is currently the top Republican on the Energy Committee. He was a principal architect of a 1997 balanced budget bill negotiated with former President Clinton, and has been a major player on national energy legislation, pushing for nuclear power and opening the Arctic National Wildlife Refuge to drilling. He's also earned a deserved reputation as an advocate for his state from his perch on the powerful Appropriations Committee, steering money to Energy Department nuclear facilities such as Los Alamos National Laboratory. He is now one of the Senate's "Old Bulls," combining affectionate respect and fear to become one of the chambers more powerful members, despite his party's being relegated to minority status last November. Domenici's health became an issue after he suffered nerve damage in his right arm while playing touch football with his grandchildren on Thanksgiving Day 1999. He underwent surgery in June 2000 to relieve pressure on nerves in his neck. But the pain persisted and in 2003 he was diagnosed with arthritis in his lower back. He began using a low-speed scooter between his office and the Capitol. But the scooter disappeared two years later after a new workout regimen and treatment by arthritis specialists. Domenici came under investigation by the Senate Ethics Committee this year after a watchdog group accused him of trying to pressure David Iglesias, then the U.S. attorney in Albuquerque, N.M., to rush a corruption probe against Democrats to sway the 2006 elections. Iglesias says he believes he was dismissed from his job for resisting Domenici and Rep. Heather Wilson, R-N.M., who both say they did not pressure him. Domenici was first elected to the Senate in the GOP landslide of 1972 when New Mexico was still a reliably Democratic state. His only serious challenge since came in 1978. 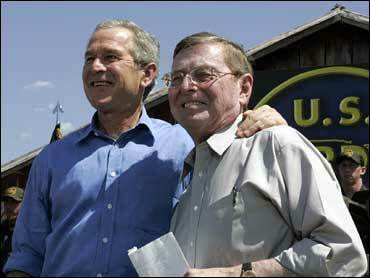 President Bush beat Democrat John Kerry in 2004 in New Mexico by a single percentage point. The son of Italian immigrants, Domenici graduated in 1954 from the University of New Mexico, where he starred as a pitcher on the baseball team. He received his law degree from Denver University in 1958, and opened a law office in Albuquerque. His retirement is expected to spur a scramble among the state's top politicians who have long hoped to succeed him. Among them are Republican Reps. Heather Wilson and Steve Pearce and Rep. Tom Udall, a Democrat. "He's an iconic figure here in New Mexico," said Paul Kennedy, a former state supreme court justice and a longtime Republican. "He's probably the most popular politician in its history. He had a great run, and he'll be sorely missed from the delegation."